“Education is the most powerful weapon which you can use to change the world” - Nelson Mandela. The only way to grow, whether it be your business, team or even yourself, is to encourage learning and continuous improvement, and to do so in a comfortable space for your employees. Yet many companies still don’t incorporate steady learning programs, perhaps because it can be inconvenient. Having your employees miss days of work to travel and attend courses is not only disruptive, but it’s costly. However technology has changed the learning landscape. Now with blended learning, employees can continue their education with less workday interruption. Blended e-Learning allows employees to have complete control over when, where and how they learn. Blended e-Learning is cost-effective. 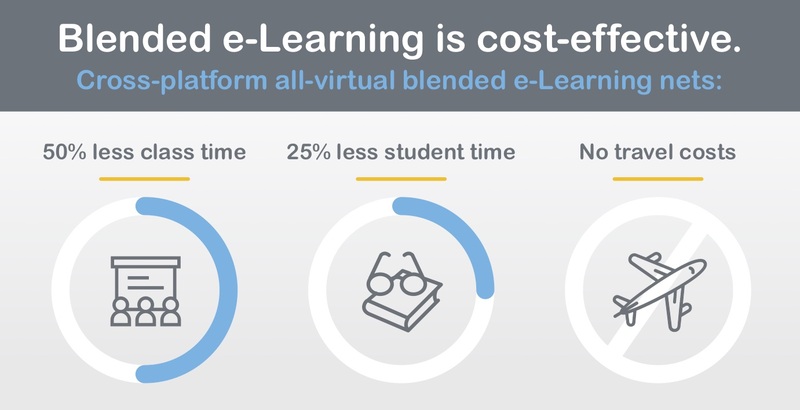 Cross-platform all-virtual blended e-Learning nets 50% less class time; 25% less student time, and no travel costs. Different types of blended learning include interactive modules for pre-work, instructor-led virtual classes with breakout sessions to collaborate with class members, and more. In fact, when blended learning courses are designed through our Opusworks’ method, there is no loss of accountability for anyone involved. We recommend you use a curriculum that is custom built for your team. The flexible design ensures the program is unique to your team’s goals. Modular content allows for flexible, easy to use customization, and includes materials, videos, and industry specific content. The framework allows you to improve your company culture by engaging employees, developing consistent competencies and improving your project results. Overall, blended learning courses can be a cultural change driver within your organization. They promote process excellence, increased understanding and engagement. They are also proven to increase employee skills, behaviors processes and most importantly, results. Learn more about our custom blended learning courses and how we can help your organization today. Lean Six Sigma Training from the OpusWorks Institute. ©2018 OpusWorks®. All right reserved.